Oh good lord, I think I just had a heart attack. My Hispanic heart swells with pride at the mere mention of tamales - but the fact that crf_kitty thought so much of tamales that she immortalized them in ALL FRENCH KNOTS makes me so outlandishly happy I could die. Just look at those knots. I dare you not to want tamales now. What a wonderful wonderful great work! I really love it!! Wow, that's gorgeous. I love the texture all those french knots create. I can not believe all the french knots! That is amazing! i agree this looks SO cool!!! I am in awe........absolutely goregous! You're right. I want tamales! this is awesome!! I love the idea of stitching an 'every day' item like packaging. very Andy Warhol. ;D great job! Wow... that is simply amazing! AAAAAAAHHHHHH!!!!!! 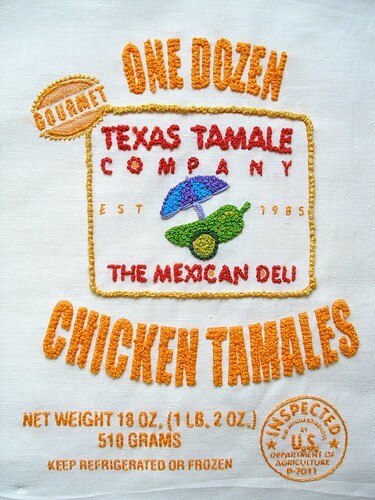 I don't know which I want more, tamales or her mad stitching skillz! I am loving this, although tamales aren't super high on my list of preferred foods. But... what a cool embroidery piece! This is wonderful! It looks like that really cool vintage letterman jacket type of stitching. Holy cow!! That is LOVE. it's so beautiful..a master piece! a master piece! it's so beautiful. WTF?? HOW does one find the patience to do that?? That is super cool! wow. that is INCREDIBLE. talent. Absolutely, positively amazing. Beautiful and yummy all at the same time.